Then fill in the details for your initial user. Usernames cannot contain spaces or special characters except - and _. Passwords must be at least ten characters in length and can be made up of any characters. Note: All users have the same level of access and will be able to monitor projects from all other users on the installation. The dashboard shows you all of your projects and their status, as well as giving you the tools to add new projects and trigger analyses. 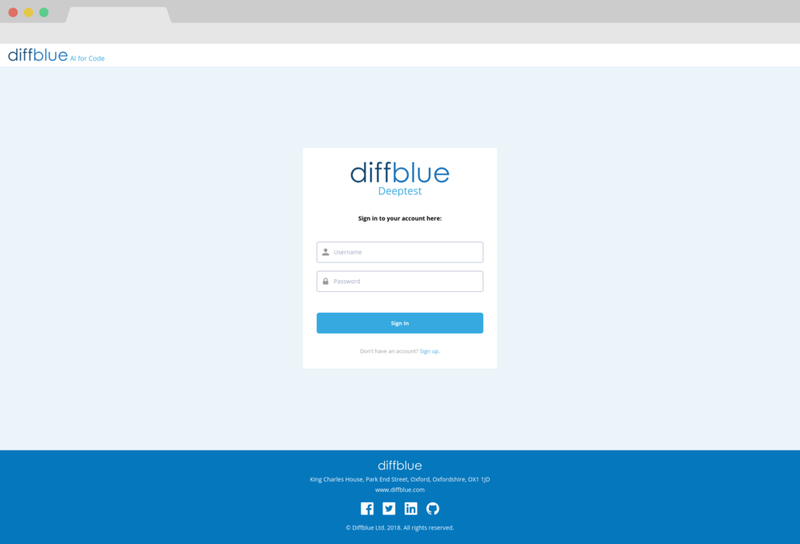 The first step to using Diffblue Cover is to connect your project by clicking Add project. From here, you can either choose to have a walkthrough using our java-demo project as an example, (this is provided with your shipped version of the product, it is a zip file called java-demo.zip) or move straight on to analysing your own repository archive. The Add a new Project prompt will ask for a project name and whether the required project is from a Git repository, publicly accessible repository URL (for private repositories see Adding Credentials), or an Archive upload which can be any archive of code from your machine. 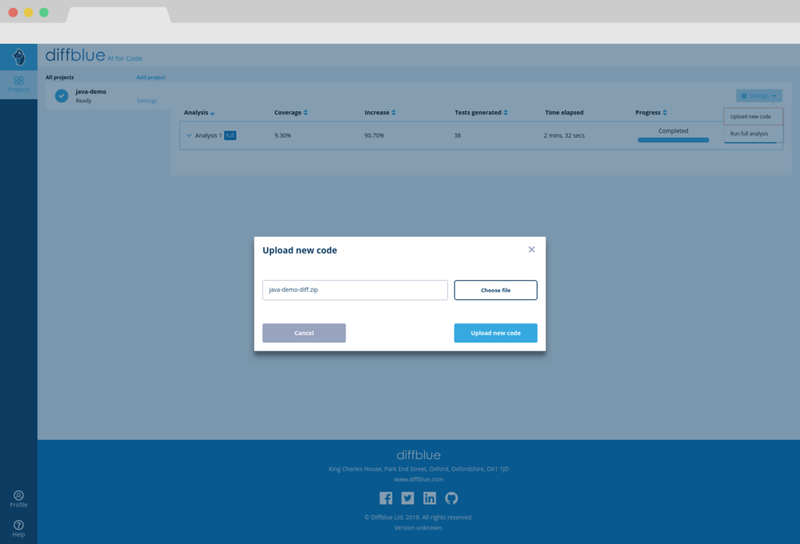 If you choose the Archive upload button, you will be presented with a file browser where you can add your source code or the java-demo.zip shipped with Diffblue Cover. Your code archive should be in zip or tar format. Once the name and archive are selected you can then click Add project at the bottom of the dialog to add the project. If you choose the Git repository option, you will need a link to your project from your version control system. 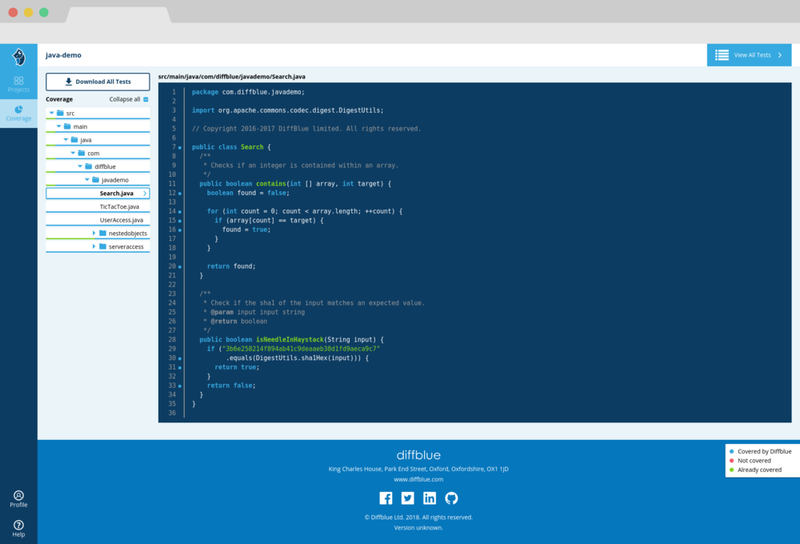 Using the example of Java Demo, input the Git repository URL to https://github.com/diffblue/java-demo, name it in a relevant way, like in this instance java-demo, and then click Continue. This will then fetch and display the branch information for the repository, allowing you to select the branch you wish to analyse. In the case of java-demo we recommend master. On selecting master the Add project button at the bottom of the screen will be enabled, allowing you to add the repository as a project. 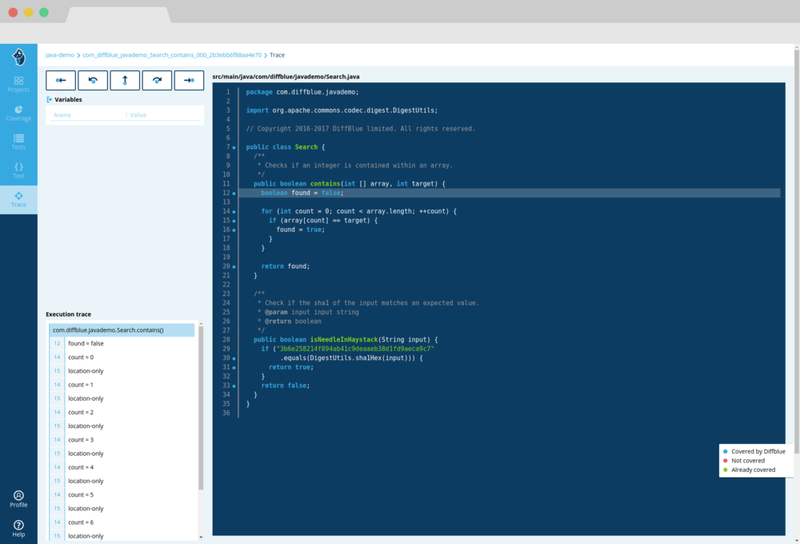 You have the option of specifying build and test commands. Note: Before running an analysis you will need to define how you compile and test your Java project. You can do this by specifying the required command using the included boxes Build Command and Test Command. See section Configuring Diffblue Cover for more information and different methods of how to successfully configure your project. If you run an analysis and nothing happens it is probably because you have not specified the build and test commands. Once the project is created it will begin cloning the repo or processing the archive selected when the project was created. Once this is complete the project will show the read icon (the Diffblue owl) and the Start analysis button will be enabled. Once the analysis starts the View results button becomes available. If the analysis is still running a progress bar will be displayed at the top of the results pages until it completes. The examples in this section assume an archive upload analysis of Java Demo. The results are shown as coverage increase over your project, which is broken down into the directory structure of your project. Green shows coverage provided by the tests within the project, blue shows the coverage Diffblue can provide with the tests generated, and red shows where no coverage from either existing test coverage or Diffblue analysis exists. Directories can be expanded and collapsed, and clicking an entry in the list gives a more detailed code view which shows the individual line coverage. The first file in your project will be opened by default. Here you can Copy test into your system clipboard or select Download java file. If you wish to use this unit test in your test suite, please ensure you have appropriately set up Diffblue Cover™ utilities; see section Executing Diffblue tests for more information. If you are working in an offline environment you can use the link in the product to directly download deeptestutils.x-y-z.tar and incorporate the files into your environment. For more details see section Offline Diffblue Cover. You can then run through the steps that were analysed to produce the test by using the debug buttons at the top, seeing the Variables at the relevant steps and jump to further steps by selecting a particular entry in the Execution trace. Click Upload new code to accept and once complete the dialogue will display Success and disappear. Your project is then ready to run a Differential Analysis against the new source. Adding -Dcobertura.skip to the project's testCmd will skip Cobertura coverage instrumentation. Adding -Djacoco.skip to the project's testCmd will skip JaCoCo coverage instrumentation.